The ChalkFest event transforms The 400 Block sidewalks into a colorful display of drawings. Since 2004, this annual art festival has showcased artists of all ages and wowed art enthusiasts who observe the creation process and enjoy the finish art. Kids under 12 can explore their artistic talents with two options. No registration required. EVENT SHUTTLE SERVICE - Park once and then ride the bus to ChalkFest, Balloon & Rib Fest and Sidewalk Sales. CLICK HERE to view the shuttle routes. Click here for ChalkFest's Facebook page! ​Wednesday, July 10 , 1 p.m. and 3 p.m.
• Learn techniques to use on your ChalkFest creation! Saturday, July 13 from 8:00 a.m. to 8:00 p.m.
Check-in for participants will be from 8:00 - 11:00 p.m. on at the festival headquarters on The 400 Block. Organizers will provide you with registration materials and space assignment. Sunday, July 14, from 8:00 a.m. to 4:00 p.m.
Artists continue working on space. • Participant judging 1:00 - 3:00 pm. If you are having trouble registering or were automatically assigned a seat that you don't want please call 1-800-838-3006 and they will move you to an available space right away. Space sizes are determined by the sidewalk seams. There are 26 different sizes in various quantities. The spaces are shown with the ranges of size in each. The largest sizes spaces may contain one or more lines. Due to these pre-set spaces and increase in participation, we cannot guarantee co-neighbor placement requests. 1. Participants must be 12 years of age or older. Those 11 and under are encouraged to be a part of a group space or to join in the Children’s Chalkfest area and must be supervised by a parent/guardian. 2. Participants must stay within their assigned space to create their artwork, be it square, horizontal or vertical and move around without interfering with artist/space next to theirs. The whole space does not have to be used. Please keep your area tidy and clean up before you leave. 3. Tents may not be placed over the sidewalk and must not interfere with another participant’s ability to work or from spectators to view the event or blocking pubic pathways. Chalkfest reserves the right to have tents moved or removed. 4. Artwork must be appropriate for public viewing: full nudes, advertising, business logos, or political statements are NOT allowed. 5. NO OIL PASTELS, OIL PAINTS OR FIXATIVES ALLOWED. 6. Chalkfest reserves the right to limit the number of people working on any space, with exception of those who have registered for shared spaces. 7. Non-compliance with these rules may result in removal from the festival. 8. 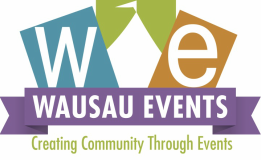 Chalkfest and Wausau Events may use photos or reproductions of artworks for future advertising and media purposes. 9. As a participant, I agree to assume all risks relating to the event and to release, indemnify, and hold harmless Wausau Events, their directors, officers, agents, employees and volunteers from and against all expenses, claims, actions, liabilities, attorney’s fees, damages, and losses of any kind whatsoever, actually or allegedly, resulting from or connected with participating in the event. Wausau Events shall not be liable for any loss or damage to any personal property, regardless of the cause of such loss or damage. GENERAL SUGGESTIONS: Wear a hat and sun block to prevent sunburn. Knee pads are strongly recommended. Pastels will be provided in multi-colors so keep in mind if you are using a predominant color in your design you may need to purchase additional sticks in that color. Some swapping of colors with other artists may be possible. Use large sidewalk chalk for base colors and blending. IN CASE OF RAIN: Clear plastic sheeting will be available, but distributed only under the direction of the committee on site. In case of severe weather, the festival will be cancelled. No refunds are available if event is cancelled. EVENT LOCATION/DIRECTIONS: If you are coming from out of town, take exit 192 off Hwy 51/ Interstate 39. Follow Hwy 52 East (E. Stewart Ave.) to the Wausau downtown City Square. Parking, food, shops and restrooms are within walking distance of the festival grounds. DOWNTOWN PARKING: Free parking all weekend in the Jefferson Street Ramp, McClellan Street Ramp, West and East Mall Ramp, all of which are located within 2 blocks from site. SPONSOR INFORMATION: ​This event is financially supported by the Community Arts Grant Program of the Community Foundation of North Central Wisconsin with funds provided by the Wisconsin Arts Board, a state agency, the Community Foundation and B.A. & Esther Greenheck Foundation, Church Mutual Insurance Company and UW-Marathon County. Supporters that helped make this event possible are the Wausau Events, City of Wausau, Center for the Visual Arts, Downtown Grocery and Voss Studios.